Are flame swords even practical? I like the Goblin use in The Amazing Spider-Man #649 because it deals with a certain Goblin I have spoken of before in 365 Days of Comics. Some readers may claim that it was random luck that a forgotten character I mentioned back in the day is now a major player in the Amazing Spider-Man. I tend to disagree with those non-believers. 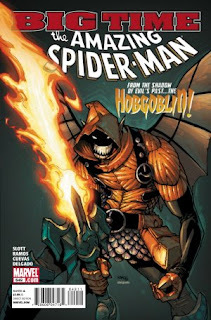 It seems rather obvious that Dan Slott reads my posts and became inspired to use a certain ear-impaling Goblin. Besides what and who the book is about, the comic of the day has more high energy Humberto Ramos art. His art is highly exaggerated and contains over the top action and movement in most every panel with a costumed character. Ramos has a style you like to enjoy for a few months after being without for about a 2 years. If I get too much Ramos I will start to hate it, but if I am treated to it every once in a while, like a Tom Cruise movie, then I am cool with it. Here's the deal...I was playing Trivial Pursuit tonight and one question was about Tom Cruise movies...thus all the Cruise. I swear.